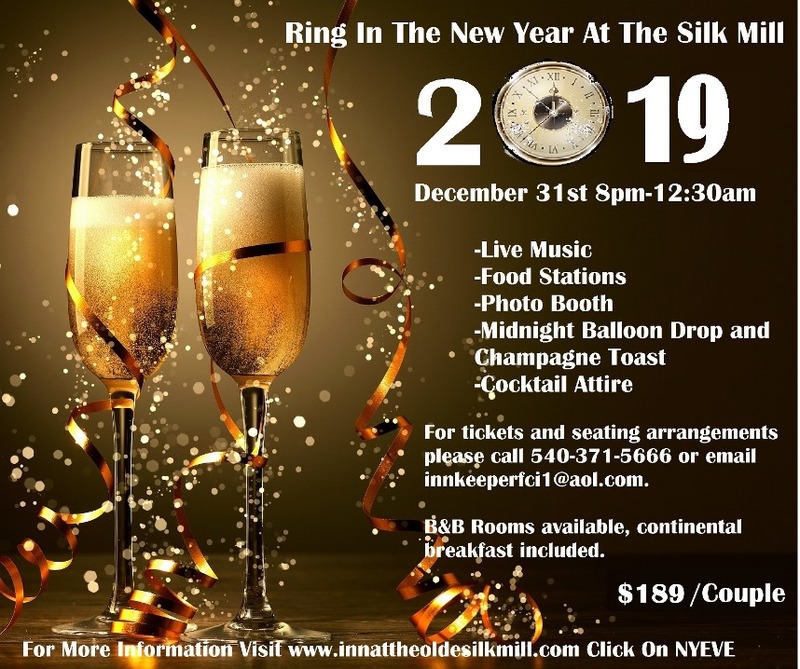 Celebrate New Year’s at The Silk Mill! Enjoy live music performed by InsideOut, an 11 piece variety band that will keep you on the dance floor all night! Dinner will be provided in the form of food stations including Asian Creation, Meat Carving, Southern Food, Seafood, and a Charcuterie table. Vegetarian options available. Have fun in the photo booth and take home a 2019 New Year’s Eve picture souvenir. New Year’s Eve countdown and celebration with balloon drop, champagne toast, hats and noisemakers. Ticket price-$189 per couple plus tax. To book tickets and reserve seating please call 540-371-5666. Tables can be reserved for groups of 8 or more. This event sells out quickly, tickets must be purchased in advance. All tickets are “will call.” Limited B&B rooms available and can be booked online through our website.